Tim's book is filled with 18 tried-and-true principles, plus the scoop on fashion's greatest divas, behind-the-scenes glimpses of "Project Runway's" biggest drama queens and never-before-revealed insights into Tim's private life. Enter to win by leaving a comment here with your favorite Tim Gunn moment! 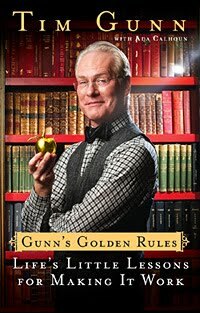 Love love love Tim Gunn. His facial expressions and comments in general are hysterical. I would love to read more about him and his personal life.